For most drivers, flying through a series of green lights one after the other is the closest thing to nirvana in the otherwise miserable experience of driving. Now, Audi is updating its embedded traffic light-reading technology to help you catch those mythical “green waves” with more precision. Audi calls the new feature Green Light Optimized Speed Advisory, or GLOSA, which tells drivers how to moderate their speed to minimize red light stops. If you recall, some 2017 and 2018 Audi models have built-in vehicle-to-infrastructure (V2I) technology that allows them to receive information from a centralized traffic light management system through the car’s built-in 4G LTE hot spot. Essentially, a sensor installed in the traffic light “talks” to the car and tells it how much time is left before a red light turns green. 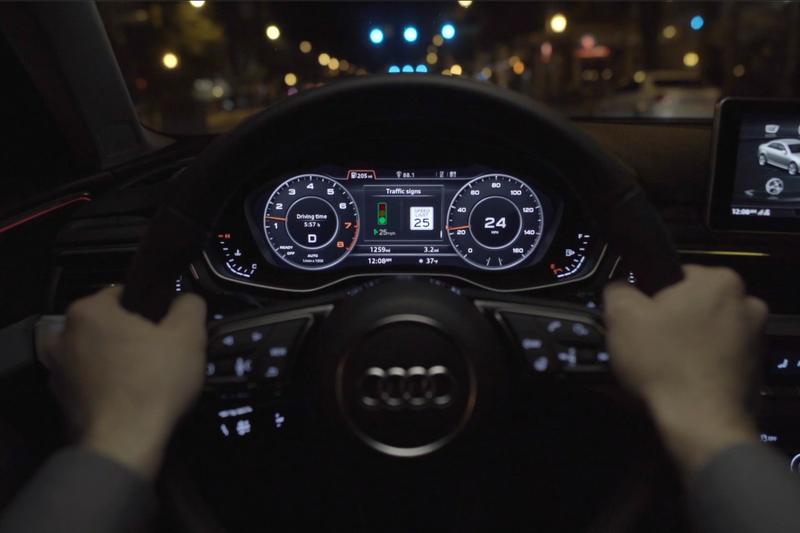 Using traffic signal information and the current position of a vehicle, Audi owners will now see a speed recommendation displayed on the screen behind the steering wheel. The distance to stop, the speed limit for the geographic area, and the timing for the specific traffic signal, are all used to calculate the speed recommendation displayed to the driver. Audi says the GLOSA feature is designed to help reduce the stress associated with being stuck in traffic. The automaker first released the technology in 2016 in Las Vegas, and it’s since spread to 4,700 intersections in more than a dozen cities, including Dallas, Denver, Gainesville, Houston, Kansas City, Las Vegas, Los Angeles, New York City, Orlando, Phoenix, Portland, San Francisco, and Washington, DC and northern Virginia. This is a step toward the connected city that some other automakers and companies have been touting as the way forward. While that may be a vision for the more distant future, the ability to see if a traffic light is going to turn green in a matter of seconds seems like a convenience that is much more attainable now. Hopefully, Audi owners won’t abuse the power that comes with being able to prognosticate when all the lights will turn green by driving recklessly or endangering the lives of other drivers and pedestrians.